How is it possible to love Cornetto, Ben & Jerry’s, and Magnum even more? Ice cream is eaten for so many reasons and in so many situations. Some enjoy a cool ice cream on a hot summer’s day. For others it’s a celebration or a treat. And yet for others it’s an indulgence for a special moment. Today, we’re looking at Millennials (18-25 year olds) and how to make them love ice cream even more. Millennials are attracted to immersive experiences that are personal, engaging, and meaningful. Experiences that enable those moments of connection by sharing. They consume products they are passionate about. They are also constantly looking for “the best of both worlds,” involving both body and mind. How to make ice-cream more relevant and create a stronger emotional connection with them? 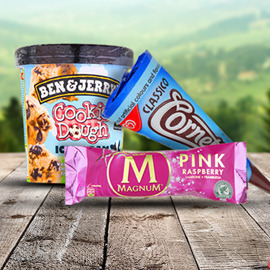 Use one of the three Unilever ice-cream brand to create your idea: Cornetto, Ben & Jerry’s, and Magnum. In a poster with an image and text, surprise us with breakthrough ideas that will engage Millennials in a whole new way and make them love ice cream even more! Format: One poster with a tagline and a short paragraph of text, using the template. Looking forward to your great ideas! Good luck!